Shravanbelagola, located 51 km south-east of Hassan in Karnataka is one of the most important Jain pilgrim centres of India. The Statue of the Jain saint Gommateshwara (AD 981)carved out of a mountain, said to be one of the tallest and most graceful statues in the world, is situated in this small town atop the Indragiri hills. The colossal monolithic statue is 58 ft high, naked, with 26 ft wide shoulders, 10-ft of its feet. Starkingly simple, the beautifully chiseled features of this statue embody serenity. Nearly 1,800 years old, the statue which is reached by climbing 700 steps carved in the steep granite slope, is symbolic of the renunciation of worldly possessions. It was sculpted by Aristanemi in 981 AD and Chamundaraya, a general and minister of the Ganga King Rachamatta installed it in 983 AD. 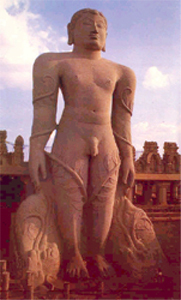 Lord Gomatesheshwara was the Jain prince Bahubali. During a war with his greedy elder brother, Bharata who sought to usurp his kingdom, Bahubali accepted defeat at the moment of his victory when he realized the futility of it all. He renounced the world and his rights to his own kingdom, much to the severe repentance of Bharata and left to lead a life of penance and meditation, attaining Nirvana. Thousands of devotees congregate here to perform the 'Mahamastakabhisheka' (sacred anointment), a spectacular ceremony which is the focus for Jain pilgrims across India, held once in 12 years. Hundreds of pots containing curds, milk, honey, vermilion, coconut water, turmeric paste and even gold and precious jewels are poured over the statue's head by priests. The next Mahamastakabhisheka will be held in 2006 AD. In addition to the statue, there are several Jain bastis (temples) and monasteries in Shravanabelagola. There are 14 shrines on Chandragiri hill and Chandragupta Maurya the Great Emperor is buried here. Of the temples the Chamundaraya basti, build in 982 is the most remarkable. There is a spacious sanctuary in Bhandari Basti about 200 meters to the left from the path leading to the Gommateshvara Statue containing the 24 images of Tirthankaras. Shravanabelagola attained historical importance when Chandragupta Maurya, the greatest King of Mauryan Empire, settled on this hill in 3rd century BC, along with his Guru Bhagwan Bhadra Bahu Swami, after renouncing his kingdom. Bhadra Bahu was the greatest propagator of Jain faith in the South.